“I can see you as you seek the solace of times past but living for the past in not where you need to be living. You are to be living for tomorrow. Immerse your life to the right wherein lie the blessings of tomorrow and receive to overflowing the resources you need to journey in faith and trust. I know the burdens you carry – the ones you are unwilling to share with others. I am preparing a feast for you, a feast made up of my sacrifices and your sacrifices. 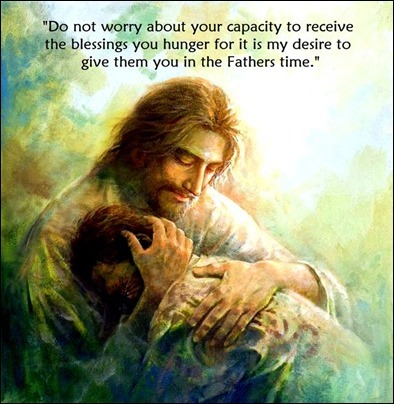 Do not worry about your capacity to receive the blessings you hunger for it is my desire to give them you. And as you reach out and partake of them you’ll see your capacity to embrace the Father expanding even to the breaking point. But do not worry I have given you the Holy Spirit to ensure you that the Fathers Blessings will absorbed into your life. When facing life’s adversities do not hesitate, do not fret and worry, but in patience wait to be embraced by the Holy Spirit bringing you the Fathers blessings in a manner designed exclusively for the journey you are on.